When you sit in a Bentley, you experience luxurious comfort, encapsulated in the very best high quality detail and finishes. 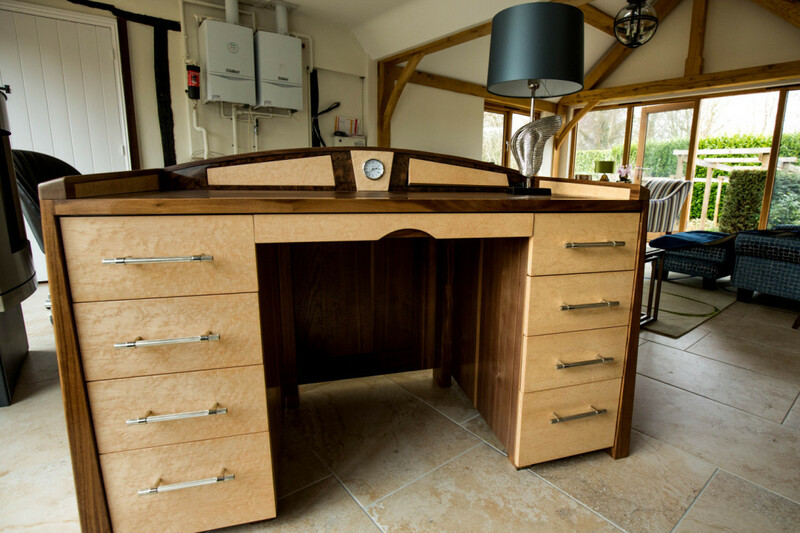 Waterhall Joinery Ltd were asked to recreate this feel in the form of a ‘Bentley’ style bespoke desk. We were approached by Interior Designer Jenny Junior (Jenny Junior Interiors), whose Client had a very personal idea for a desk – the desk was to incorporate elements of design that gave a nod towards his love of Bentley cars. Bentley, a British manufacturer and marketer of luxury cars, produce cars that have extraordinary detail and are steeped in heritage. Their cars showcase magnificent interiors, with walnut dashboards, sumptuous leathers, high definition sounds and elegant surfaces that shine with their ‘liquid’ finish. We needed to replicate this in the Client’s vision. We worked with the Interior Designer Jenny Junior, to look at the shape and forms of the Bentley, how we could create a design that would recreate the quality and character of this historic car. 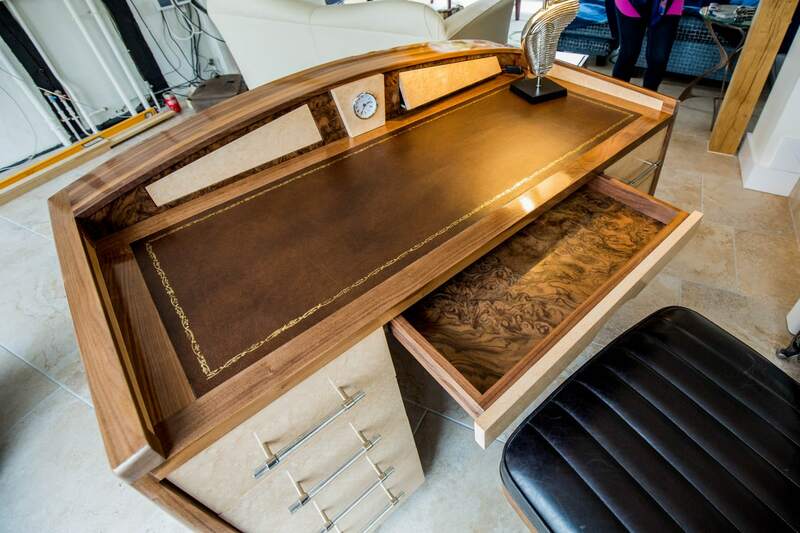 Having decided on the design, structure and form of the desk, high quality ‘instruments’ were sourced to complete the feel and expectations of sitting in the luxury of a Bentley style desk. To transport you to the feel of sitting at the elegant control seat of a deluxe Bentley, we created a curved front to represent a dashboard, complete with clock and glove compartment style doors. The contrast of Birds Eye Maple and Burr Walnut imitating the cream leather interior against a Walnut dashboard. A red cows leather inlay gave the soft touch of leather to the desktop. The glove compartment held sockets for lamps and laptops for effortless connectivity that would hide away wires in the background. For the exterior of the desk we continued use of American BlackWalnut and Birds Eye maple in an art deco style. The corners and edges were curved rather than sharp, like the chasis of a car. Finally the handles supplied by Joseph Giles, have cross hatchings matching the gear stick design of a Bentley. A truly wonderful project that Waterhall Joinery had the delight of working on. 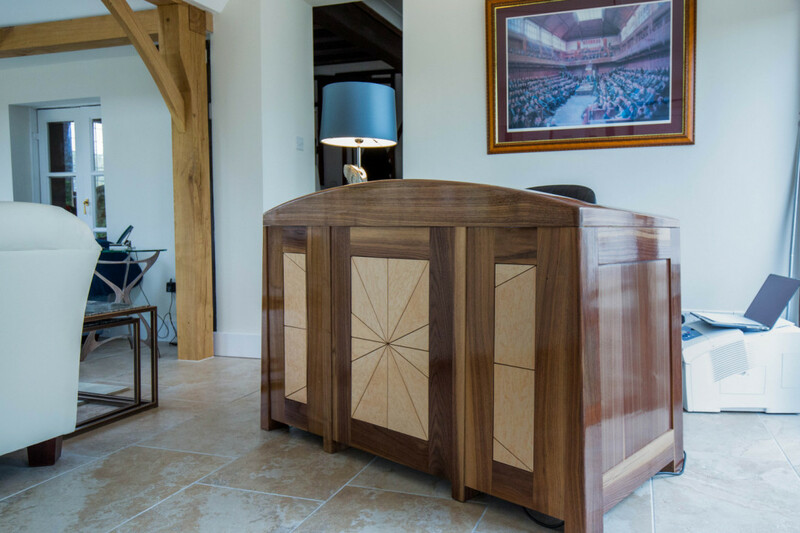 Bespoke joinery – allowing you to express your own vision.